The KitchenAid Gourmet Box Grater allows easy, mess-free grating of foods and cheeses. 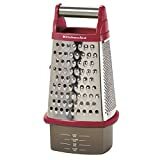 This box grater features a stainless steel top handle for superior comfort and grip as well as a high quality, rust resistant stainless steel grating surface and slicing blade. Fitting in the box grater is a 3-cup container to catch the grated or sliced food. The container has capacity markings of 1/2-cup, 1-cup, 1 1/2-cup, and 2-cup; allowing for precise grating measurements for any recipe. Dishwasher safe for easy and quick clean up. One year hassle-free replacement and lifetime limited warranty. This fine product is warranted to be free from defects in material and workmanship. For one year from date of purchase, under normal use and care, KitchenAid will replace these products free of charge, if they are found to be defective in material or workmanship. In addition, from year two through the life of the products, any piece found to be defective under conditions of normal use and care will be repaired at no charge or replaced with the same item or an item of equal or better value. For more information call the KitchenAid Customer Satisfaction Center toll-free at 1-800-541-6390 or visit our web site at www.KitchenAid.com.